The other night I was at a business reception and found myself sitting next to two people I didn’t know well. After about 15 minutes, I realized that we had been having quite a satisfying and provocative conversation. I felt like my brain had been challenged by new perspectives. 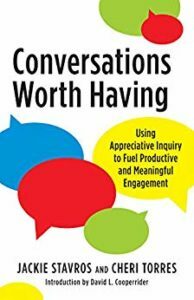 Meaningful, stimulating conversations like these have been on my mind lately, ever since reading the terrific new book, Conversations Worth Having: Using Appreciative Inquiry to Fuel Productive and Meaningful Engagement by Jackie Stavros and Cheri Torres. The authors are good friends who used their own conversations as colleagues and their combined years of field research as the basis for their important message. They write that great conversations are rich, deep and allow for the creation of new images and metaphors. They can change how people think. These interactions are uplifting and energizing, positive and productive. Conversations can be critical and destructive, or they can be generative and productive. Research for my book The Genius of Opposites: How Introverts and Extroverts Achieve Extraordinary Results Together, revealed that when opposites “Bring On The Battles” or face disagreement head on, they report stronger results than when they avoid conflict. I like the idea of adding a positive spin to these “battles”. For instance, asking the question, “What is the problem, complaint or thing you don’t want?” followed by “What is the positive opposite, the thing you want ?” and “…….What is the desired outcome?” give us helpful ways to reframe the dialogue. Both Introverts and extroverts can connect and move their partnerships forward by adding questions like these to their interactions. Introverts, with their propensity for one-on-one explorations and depth in their connections, will appreciate the framework that allows them to go even deeper. Extroverts, with their natural connection to people, enthusiasm and ease in asking questions can use this framework to keep the dialogue moving forward in a positive direction. Both parties benefit. And there are more reasons for having these conversations. Listen to what Cheri Torres told blogger and leadership expert Skip Prichard when he asked about why conversations don’t get enough attention in business. So let’s get off our phones and have an authentic conversation. How is that for an idea worth having? This entry was posted in Uncategorized on July 26, 2018 by Jennifer Kahnweiler.